Events Archives | Wedding Band | Corporate Function Band | Party Band | Berkshire | !daft! Planning the perfect wedding at The Buckinghamshire Golf Club, Denham is not an easy thing to do. There are so many aspects to consider and people to please. It’s no surprise that some can find it all a bit overwhelming. Over the years !daft! has had the opportunity to work with hundreds of brides and grooms to help them plan their perfect wedding entertainment but this time round Sophie & Billy knew exactly what they wanted, and it wasn’t “second best”. From the very start Sophie and Billy knew they wanted a party. Not just any party but a BIG party. After a long day of ceremonies and formalities they wanted to be able to let their hair down and enjoy time with their friends and family on the dance floor. 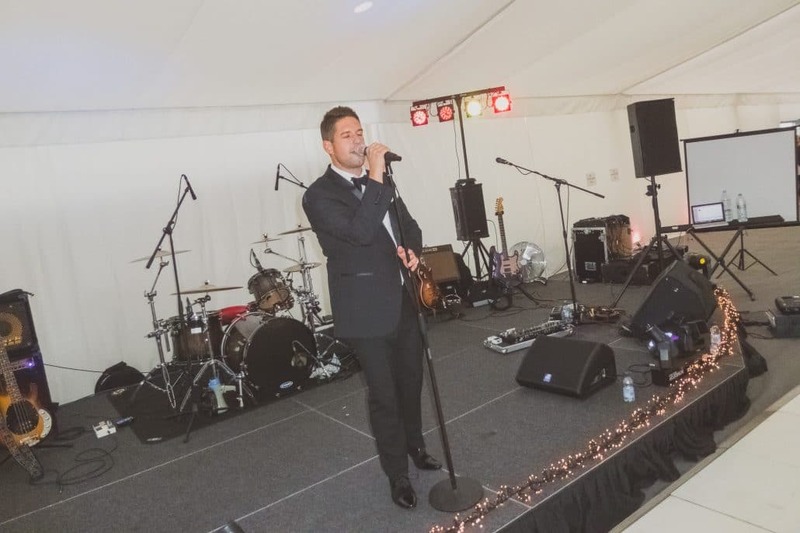 But there was no compromise to be made on quality so to ensure they had the very best live entertainment for their wedding at The Buckinghamshire Golf Club, they booked our hugely popular wedding Gold Package. The Gold Package remains one of our most popular live wedding entertainment booking packages because it provides a whopping 2 x 60 mins live sets of rock, pop & indie covers as well as our professional wedding DJ service. The Buckinghamshire Golf Club provided a stunning location for a wedding reception along with superb facilities. You can find the Marquee set alongside beautiful lakes and lush, rich greens making the for a visually stunning sight. 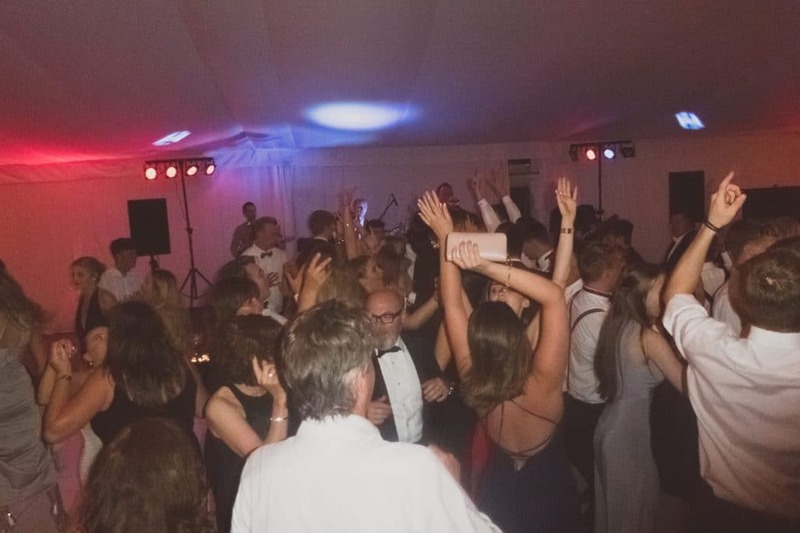 Wedding and event staff had decorated the marquee beautifully with 3 hanging chandeliers, white LED dance floor, exquisite tableware, well-stocked bar and us, the band, all in the same room. Marquee weddings work particularly well because they keep everyone together. Sometimes it can be frustrating when all your guests are spread out across various rooms and locations. 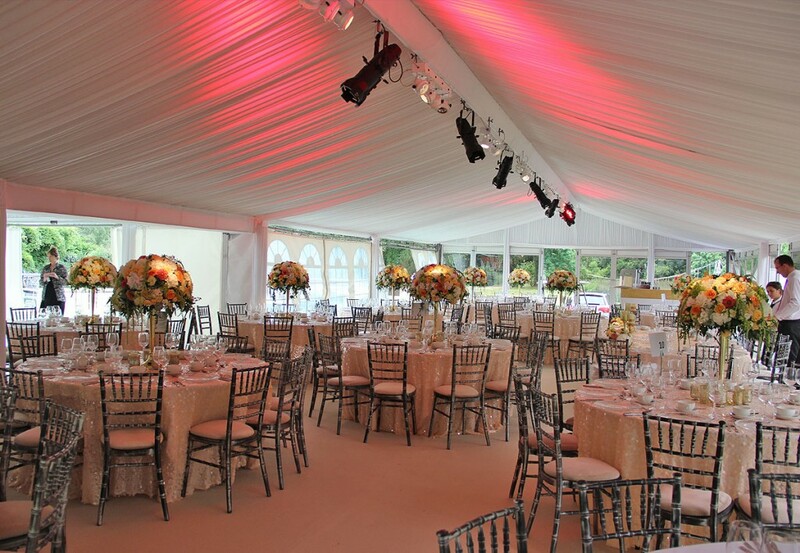 Marquees focus all your guests and activities into one general area which helps keep momentum and spirits up. 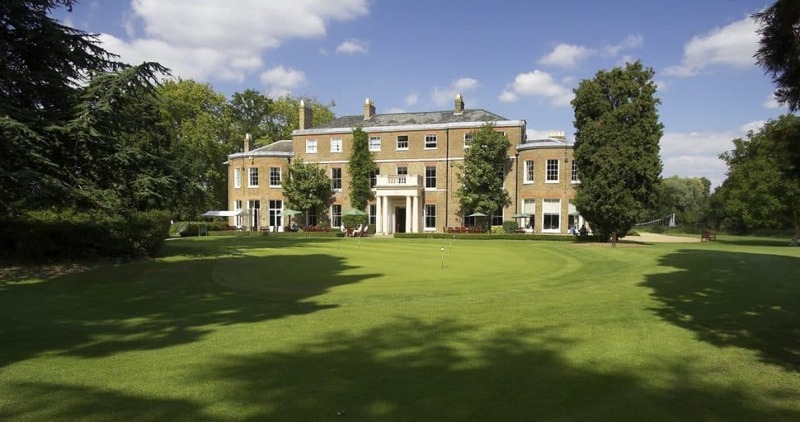 You can find out more about wedding, parties and event at The Buckinghamshire Golf Club here. 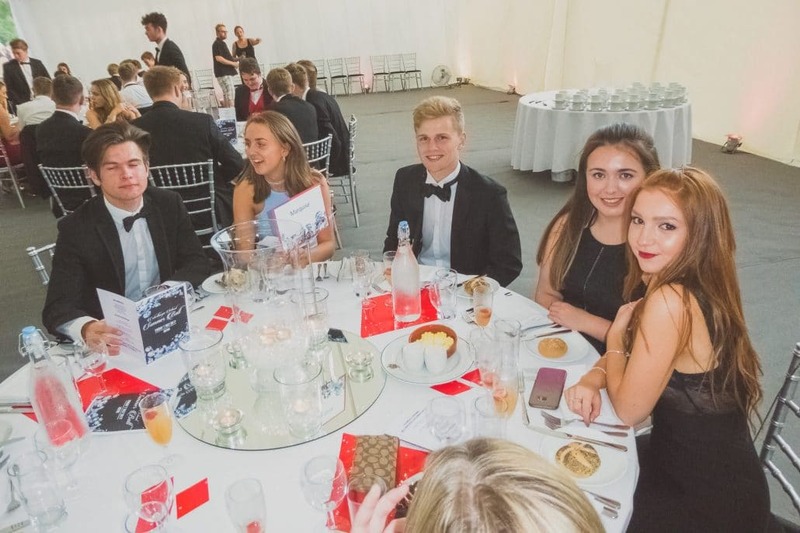 Finally, we’d like to give a shout out to Alex from The Buckinghamshire Golf Club for his incredible work on the night and in support of the band. He went out of his way to assist us and make sure the wedding was the very best it could be. Thanks, Alex! Huge congratulations to Caroline & Brett who held their wedding celebration at Magnolia Park, High Wycombe, and who booked us to provide their entertainment. Bands have no better weddings to play than the ones with fun, friendly and up-for-it people. It makes for a great night all round when the crowd are ready to let their hair down. Thankfully, Caroline & Brett’s friends and family had this all in abundance. Caroline & Brett held their wedding at the very cool Magnolia Park Country Club in the Hughenden Valley. The Country club is very easy to get to and also idyllically set just outside of High Wycombe. Magnolia Park is set in acres of beautiful grounds with lots of space for marquees and even fairgrounds! It is the second time !daft! 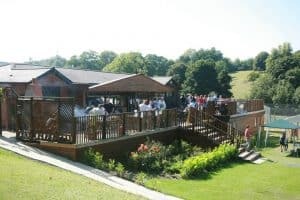 has had the pleasure of playing at Magnolia Park, something we will never tire of doing as the venue is such a pleasure to be at and the staff are always incredibly friendly and helpful. Big thanks to Greg for looking after the band so well! Find out more about Magnolia Park here http://www.magnoliaparkwycombe.co.uk. It was awesome and everybody loved it, it was fantastic! Caroline and Brett booked our Gold Package and enjoyed 2 x 60 min live sets along with our disco service. Their wedding was booked in mid-2016 which ensured the date was free in our diary and secured it for them nice and early. It also gave the Caroline and Brett lots of time to have all the necessary conversations with us to ensure we planned correctly for the event. We’d like to say a heartfelt thanks to Caroline & Brett for booking us, we thoroughly enjoyed the wedding party and we hope to see you and your guests again soon! The sun has set on this year’s Burnham Park Hall Festival, and oh my, what a success it was! Only in its second year, the festival hosted 9 local bands throughout the day. In addition you could chill out in the hall’s secluded, sun-trap courtyard with a variety of acoustic soloists, duo and trios. Thankfully, given the nature of the heat on the day, the festival has a food and drink angle to it too. For the peckish there was selection of food vendors including an incredible African street food stall. For the thirsty, as most seemed to be, strangely, there were a range of Rebellion ales from the local Marlow Brewery and a perfectly-pitched Pimms & Prosecco tent for the ladies. The event basked in the ridiculous glory of the British summer peaking at around 32°C. For events like this it is nice to have a dry day, great to have a warm day but it was something else to have had a day like we had. I am not sure we will ever be that lucky again and it made all the difference. Going off the first year the attendance this year was through the roof. Estimates are that around 3500 people visited, many with children and most sticking around for most, if not all, of the day. A headline performance from !daft! !daft! are truly delighted to have been part of this amazing event and we look forward to seeing you all again next year. The Holiday Inn, Shepperton hosted a fantastic wedding which we were delighted to be a part of. Huge congratulations to Clare & Darren who celebrated their wedding in May 2017 and who booked !daft! to provide their wedding entertainment. Clare & Darren had their amazing wedding at the excellent Holiday Inn, Shepperton. Set alongside the hotel’s lake with a wonderful open space to relax with their guests and their evening party inside the hotel come the evening. The hotel team led by Chloe and Sarah were phenomenal and amongst some of the best, and most helpful, wedding teams we have ever worked with. A massive thank you to them both for all their hard work and assistance to us. We were also delighted to make a highlights clip of the wedding which you can on this page. We love making these kinds of clips and hope to many more of them in the future. Clare & Darren booked in early 2016 for their 2017 wedding and enjoyed our Gold Package meaning that they didn’t have to worry about anything music-wise, leaving us to take care of the DJ’ing and provide our inimitable live performance. Thank you to Clare & Darren for booking !daft!, we thoroughly enjoyed performing for you and hope to see you again soon. !daft! is the perfect band for birthday parties and we were delighted to have joined up with DJ Events to provide entertainment for Miki & Wesley. We highly recommend DJ Events, they are a great team and great guys who know what they’re doing. They know how to get the most out of an event and party and how to make it truly spectacular. If you’re having a wedding, party or function you should definitely give them a call. You can contact James or Harvard on 0333 577 7050. Rather uniquely this party was a double celebration. Husband and wife Miki & Wesley celebrated together in true, all-out style. The event was held at the beautiful Northcote House, found on the grounds of Sunningdale Park. To add the extra touches they had overflowing jars of Ferrero Rocher, roaming drinks girl, light up “40” LED numbers, indoor fireworks, live band, DJ and the most incredible staging and production. DJ Events booked !daft! to provide our inimitable birthday party live music experience, sound engineer and stage manager. We performed 2 x 45 min sets for the clients and featured our decades set list performing music from the 60s, 70s, 80s, 90s to today. Our repertoire and delivery style is perfect for 40th birthday parties. We had an amazing response from the clients and audience and thoroughly enjoyed playing for them. Many thanks to DJ Events for booking us, it was, and always is, a great pleasure to work with them. Click here to contact us and talk about your special event. You can also reach us on 0333 456 4556.